Express Entry Draw No. 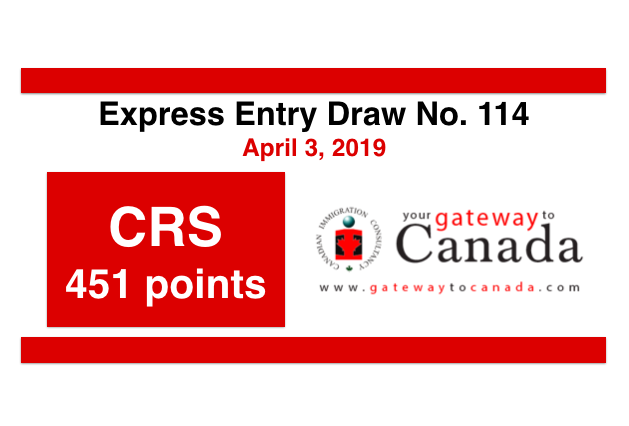 114 (April 3, 2019): CRS Score 451 Points - Gateway to Canada | Canada Immigration Consultancy! The CRS Score of the lowest-ranked candidate for this April 3, 2019 draw is 451 points. Express Entry is the system being used by IRCC to manage Federal Immigration Programs such as Federal Skilled Worker, Canadian Experience Class and Federal Skilled Trades Class. Candidates are being ranked using several factors like education, work experience, age, language proficiency, etc. Candidates with Canadian work experience, Canadian education credentials and nomination from Provinces have a higher chance of getting invited. Check out the Express Entry Draw Archive to see the Express Entry Draw history. There are more than 60 pathways to become a permanent residence in Canada. Take this FREE Online Assessment to check which one is best for you or attend one of seminar schedules.